Hazards and Health Risks Associated With Being Overweight or Obese: What Comorbidities are Linked to Obesity? The intended audience for the activity is internal medicine physicians, general practice physicians, family practice physicians, endocrinologists, cardiologists and other health care professionals involved in the treatment of patients with obesity. 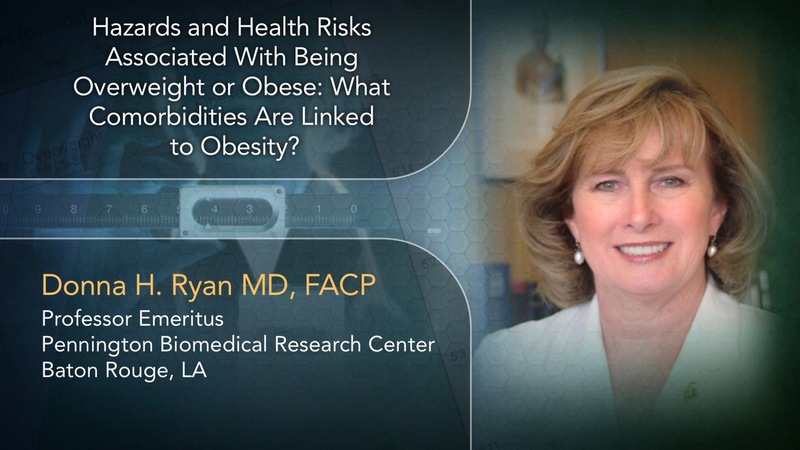 Examine the link between the pathophysiology of obesity and associated comorbid conditions. Select patients for intervention based on evidence-based criteria, which includes diet and lifestyle modifications, pharmacotherapies, and surgery. Obesity has increased dramatically in the past 20 years, and is considered a health care epidemic in the United States. One-third of adults in the United States are considered obese, having a body mass index (BMI) ≥30 kg/m2, according to the US Centers for Disease Control and Prevention. Serious health concerns associated with obesity include increased risk for hypertension, stroke, coronary heart disease, dyslipidemia, type 2 diabetes mellitus (T2DM), depression, sleep apnea, osteoarthritis, infertility, as well as cancers of the colon, breast, and endometrium. A BMI of ≥35 kg/m2, increased waist circumference, and waist-to-hip ratio are predictors of increased risk for mortality. Evidence suggests that losing even 5% of body weight can produce clinically relevant decreases in insulin resistance, decreases in blood pressure, and improvements in lipid profiles. Although some patients will successfully achieve weight loss with changes in diet and exercise alone, these patients represent the minority, and a significant percentage of patients who are successful are unable to maintain weight loss over time. Staying current with evidence-based recommendations for treatment, including knowledge of the safety and efficacy of emerging therapeutic options, is vital to health care practitioners as they work with patients to develop optimal, individualized, long-term strategies for overcoming obesity. This program will consist of a series of four video vignettes presenting interviews with clinical experts who will explore some of the most pressing issues in the management of patients with obesity. Vindico Medical Education designates this enduring material for a maximum of 1.0 AMA PRA Category 1 Credit(s)TM (0.25 credits per video). Physicians should claim only the credit commensurate with the extent of their participation in the activity. This enduring material is approved for 1 year from the date of original release: December 18, 2013 to December 17, 2014. To participate in this CME activity, you must read the objectives, answer the pretest questions, read the articles, complete the CME posttest, and complete and return the registration form and evaluation. Provide only one (1) correct answer for each question. A satisfactory score is defined as answering 2 out of 3 post-test questions correctly for each video. Upon receipt of the completed materials, if a satisfactory score on the posttest is achieved, Vindico Medical Education will issue an AMA PRA Category 1 Credit(s)™ certificate. Consulting Fees: Eisai Inc., ISIS, Novo Nordisk, NPS, Orexigen Therapeutics Inc., Zafgen Inc. Consulting Fees: Nestle, Novo Nordisk, Retrofit, VIVUS Inc., Zafgen Inc. Consulting Fees: Arena, Dainippon Sumitomo, Eisai, Novo Nordisk, VIVUS Inc.
Fees for Non-CME Services Received Directly from Commercial Interest or their Agents: VIVUS Inc. The medical director, Maya Mehta, MD, MBA, and production staff of BetterCME have no relevant financial relationships to disclose. Created and published by Vindico Medical Education, 6900 Grove Road, Building 100, Thorofare, NJ 08086-9447. Telephone: 856-994-9400; Fax: 856-384-6680. Printed in the USA. Copyright © 2013 Vindico Medical Education. All rights reserved. No part of this publication may be reproduced without written permission from the publisher. The material presented at or in any of Vindico Medical Education continuing medical education activities does not necessarily reflect the views and opinions of Vindico Medical Education. Neither Vindico Medical Education nor the faculty endorse or recommend any techniques, commercial products, or manufacturers. The faculty/authors may discuss the use of materials and/or products that have not yet been approved by the US Food and Drug Administration. All readers and continuing education participants should verify all information before treating patients or utilizing any product.